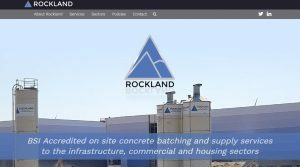 Quantum PR was recently commissioned to redesign the website for on-site concrete batching specialists, Rockland Concrete. Based in Hertfordshire, Rockland Concrete works all over the UK providing a variety of construction sites, from housing developments to industrial parks, with concrete batching solutions. Quantum was tasked with updating Rockland’s existing website by streamlining important information on the navigation menu and showcasing sectors in which Rockland serves to make it easier for users to find exactly what they are looking for. Additionally, it was essential that the new website was mobile friendly and responsive, refreshing the user experience. To demonstrate how simply Rockland’s on-site batching can be set up and dismantled on construction sites, the design team came up with the idea of a video animation charting each step of the process.